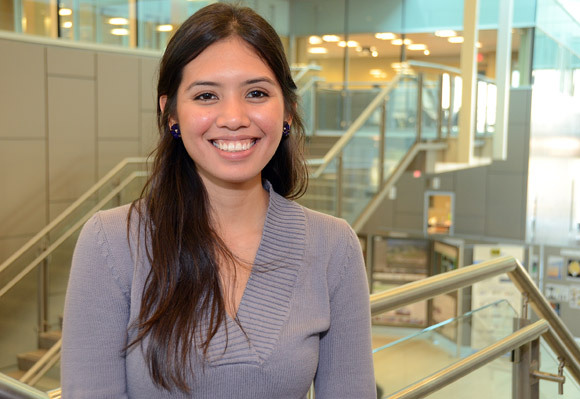 Originally from Mexico, Karen Robles has been studying mechanical engineering at the University of British Columbia’s Okanagan campus for the past four years. She will spend the next two years earning her master’s degree before entering the job market. She plans on staying in Canada after her schooling is complete. Karen Robles would jump at the chance to work in the Okanagan, but if she has to move elsewhere, she will – as long as she can stay in Canada. The Mexican native graduated from the University of British Columbia’s Okanagan campus mechanical engineering program in June. Having completed the four-year program she immediately signed up for another two years to get her master’s degree. “I like BC so it would be nice to stay here,” says Robles of her future plans. Robles says she would like to see more of Canada and is willing to move, but she is also willing to stay if the right opportunity presents itself. The daughter of a surgeon in the Mexican city of Torreon, she knows of many classmates who are already working in their chosen field. “Most of my friends already have a job. A lot of them are from here and most of them found jobs in BC,” she says, adding she would recommend coming to UBC’s Okanagan campus to her friends and family back home. Woody Cross, foreign skilled workers co-ordinator with the Central Okanagan Economic Development Commission, said there is still a demand for foreign workers in the region. However, like most sectors, the demand has decreased from its peak before the 2008 global economic crash. But that is not to say skilled workers need look elsewhere. Cross said there is still a need for engineers, nurses, IT specialists and other highly skilled positions. Cross said he takes advantage of having highly skilled graduates right in his own backyard, adding he makes sure local employers know about graduates from UBC’s Okanagan campus. Once they graduate, international students can get a three-year, post-graduate work permit, and Cross said his office has programs in place to help graduate students gain permanent residency. All of the international students at UBC’s Okanagan campus will be honoured Thursday at 3 p.m. in the lower foyer of the Engineering, Management and Education building during International Students Day. Teresa Flanagan, manager international programs and services, said there are 591 international students representing 79 countries on campus this year, an increase of almost 100 students over last year. In 2006, there were 127 international students. Ian Cull, associate vice president, and Wes Pue, provost and vice-principal, will be addressing the students at the event. Robles will be the emcee for the event.